Gene Roddenberry was an American television writer, writer, producer, and creator of the series Star Trek. 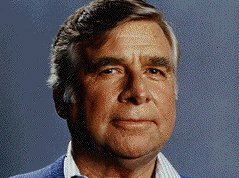 Born in Texas, Roddenberry grew up in Los Angeles; he was a frequent reader of science fiction, but his first sales as a writer were articles on flying and some poetry. A pilot in World War II, he flew for Pan American after the war and was the hero of a crash in the Syrian desert. He became a Los Angeles police officer in the mid-1950s; simultaneously he sold scripts to many television dramas. He quit the force to become head writer for Have Gun Will Travel and later created the series The Lieutenant. Roddenberry's biggest success, Star Trek, was influenced by the film Forbidden Planet (1956) and informed by his own staunch liberalism. After that series was canceled, Roddenberry wrote and produced a non-SF theatrical film, Pretty Maids All in a Row (1971), but its lack of success brought him back to TV and SF. He produced and wrote (or co-wrote) several TV movies, each a pilot, although none resulted in a series. These include Genesis II (1973), Planet Earth (1974), the fantasy-horror Spectre (1977), and The Questor Tapes (1974), the best of the lot. Roddenberry has been only peripherally involved with the Star Trek theatrical films and TV series "sequel," Star Trek: The Next Generation, and he has always been active as a spokesman for the original Star Trek series and its spin-offs. He is much more significant as a producer than as a writer of SF: few number his episodes as the best of Star Trek. Although his ideas are earnest and often intelligent, they are generally also overstated and do not bear close examination as science fiction.